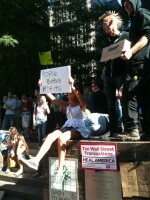 The Occupy Wall Street protesters have been widely criticized for “not having demands”, as if the lack of a clearly articulated policy platform undermines the legitimacy of those crying foul at a system that seems rigged – politically and economically – in favor of the well-connect and wealthy few. But creating rules and incentives to effectively safeguard fairness, equity and opportunity in the global economy is complicated. Fixing what’s broken cannot be achieved with a single simple demand, or even a five-point plan. Yet despite the difficulty of identifying a single unified policy platform, some solutions are clear. There is widespread sentiment among many of the Occupiers that reducing the extraordinary influence of money in politics is imperative. This strong commitment to direct democracy is exemplified in the way Occupation working groups operate by consensus, in a transparent, non-hierarchical structure, with a sort of ‘Robert’s Rules of the Occupation’ designed to ensure that all voices get heard. Dismay with the Supreme Court’s decision in Citizens United is widespread, which suggests the possible salience of a populist movement for a constitutional amendment to prohibit corporate campaign donations, strengthen public financing of elections and curb the impact of special interests on campaigns. This could be accompanied by parallel pressure to reduce the disproportionate influence exercised by wealthy and connected elites and corporations through lobbying. Deep and significant reform to reduce the sway money exerts through campaign contributions and lobbying would help restore faith in the basic functioning of American democracy. Likewise, financial industry insiders who recklessly sell low-grade assets to unsuspecting investors, on the basis of misleading information, turning a blind-eye when they should have known better, should face civil and criminal liability. In April, the bipartisan Senate Permanent Subcommittee on Investigations released the findings of a two-year investigation into the causes of the financial crisis. Among other revelations, according to sub-committee Chairman Carl Levin, the report concluded that “WaMu selected and securitized loans that it had identified as likely to go delinquent, without disclosing its analysis to investors who bought the securities, and also securitized loans tainted by fraudulent information, without notifying purchasers of the fraud that was discovered”. In the so-called Abacus Transaction, “Goldman Sachs structured, underwrote, and sold a synthetic CDO called Abacus 2007-AC1, did not disclose to the Moody’s analyst overseeing the rating of the CDO that a hedge fund client taking a short position in the CDO had helped to select the referenced assets, and also did not disclose that fact to other investors.” In other words, Goldman Sachs marketed deals to its clients as good investment opportunities while simultaneously betting that these very same deals would fail. Although under existing law it might be difficult to pin legal culpability for these deals gone awry on those responsible, legal reforms are needed to make it easier to hold bankers directly accountable for reckless behavior. And there are other measures – none particularly radical – that can and should be taken to reduce risks and volatility and increase transparency and accountability in financial markets. Strengthening regulation, supervision and transparency in the banking sector, including through higher bank capital and margin requirements, would significantly improve risk management and governance. This is already in the works with Basel III. A multilateral Financial Transaction Tax (FTT) – which would impose a low-rate (e.g., 0.5-1 basis point) tax on currency exchanges and trades of global stocks, bonds, and derivatives – could raise 0.45% of world GDP, according to an IMF research paper issued this spring. That amounts to over $250 billion to fight poverty and foster equity and opportunity worldwide. France and Germany, along with Joe Stiglitz and Bill Gates, are pushing the G20 to embrace a global FTT. Despite financial industry complaints, a FTT applied broadly to all securities and derivatives transactions, on a multilateral basis, would not distort financial markets as it would be very difficult for banks and traders to dodge. And at a low-rate would have little impact on the availability of capital for growth-creating, long-term investments. Many of the Occupiers agree that corporations, and the top 1 or 2 or 10%, should be paying a higher share of taxes, since those groups have reaped a hugely disproportionate share of the benefits of economic growth over the past three decades. A group of Occupiers is currently marching from NYC to DC, demanding that the Supercommittee role-back the Bush tax cuts. Increasing taxes on capital gains and closing corporate tax loopholes would allow renewed investments in critical public goods like roads and railways and schools, and strengthen the social safety net for those displaced by rapid shifts in the global economy. The President’s Jobs Bill already calls for $100 billion in investments in infrastructure, including $10 billion for a National Infrastructure Bank, $30 billion to modernize and green public schools and community colleges, and $50 billion to upgrade transport networks. If these infrastructure investments are made in green industries, they could generate employment in the short-term and spur the innovation needed to create jobs, growth and opportunities in the long-term. All while retooling our economy for a more sustainable future. Unsurprisingly, there is also a hunger among the Occupiers for more innovative ideas. For example, a serious student loan bail-out program would, like TARP, allow young people now drowning in student debt to clear their own balance sheets and invest instead in innovation and entrepreneurship. When students graduate with tens and hundreds of thousands of dollars of loans, it’s impossible for them to take the kinds of creative risks that are the engine of growth in an economy, like the U.S., where new businesses account for the majority of new jobs. A student loan bail-out program, which could wipe clean the slates of young people who are pursuing innovative entrepreneurship to build their own futures, would restore basic principles of equity while sparking small business creation and innovation. The Occupy protests have succeeded in galvanizing a conversation in the United States – unseen since the 1970’s – about inequality, opportunity, the influence of money in politics, and the outsized power of corporations and financial institutions. Whether the renewed national dialogue ignited by the occupations will result in substantive changes that have a meaningful impact on peoples’ lives remains uncertain, but one great advantage of an occupation is that it is an extremely teachable moment. If the long winter does not break the occupiers, and if they use their time under siege of weather wisely, come springtime they could emerge as a battle-hardened cadre of skilled organizers well-positioned to influence the issues at stake in the 2012 elections.